The Action Pack puts you into the game like never before. 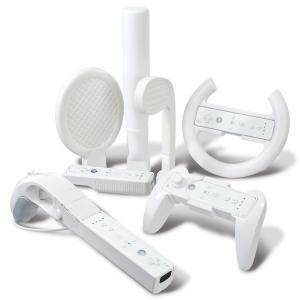 Baseball, Tennis and Golf games on your Wii can now be played with the realistic feeling of swingin a bat, racket or club while maintaining soft and safe texture. With the easy to use snap-in design, you'll be experiencing true wireless virtual game play within seconds. 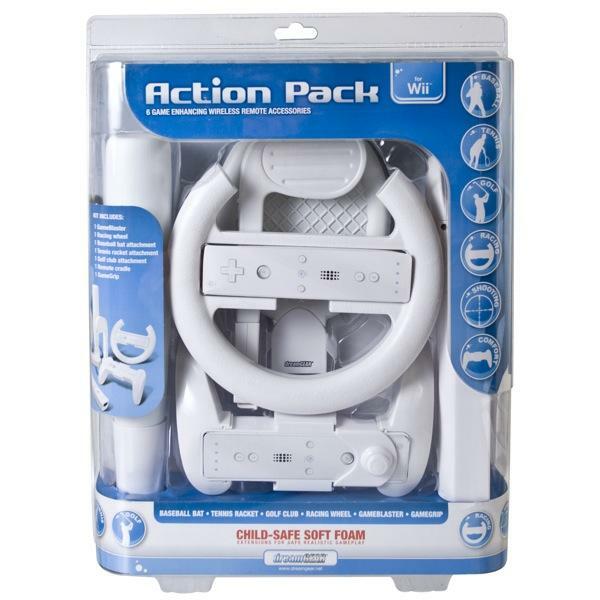 The Action Pack also includes a Racing Wheel that will give you an exciting racing experience, a GameBlaster for all of your favorite shooting games, and a GameGrip for enhanced comfort and functionality when using the Wii Remote as a standard controller. Hug the turns, leave the competition in the dust, knock one out of the park, hit a hole-in-one, blast the competition and grip the remote in style with the Action Pack designed exclusively for Nintendo Wii. Bring the excitement to a new level!